Fond memories of our very special brother and uncle. 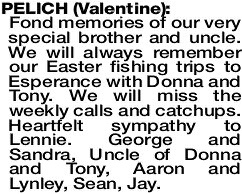 We will always remember our Easter fishing trips to Esperance with Donna and Tony. We will miss the weekly calls and catchups. Heartfelt sympathy to Lennie. George and Sandra, Uncle of Donna and Tony, Aaron and Lynley, Sean, Jay. The Funeral Service to Celebrate The Life Of Valentine Pelich of Ellenbrook will be held at the PINNAROO Valley Memorial Park, Whitfords Ave Padbury on THURSDAY (11.04.2019) In the West Chapel commencing at 2.00pm. 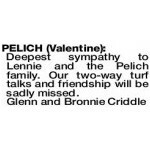 Deepest sympathy to Lennie and the Pelich family. Our two-way turf talks and friendship will be sadly missed.